It is best to arrive early at the Herculaneum excavations to buy the cheapest tickets onsite and to enjoy a pleasant quiet visit of the archaeological site near Pompeii and Naples before tour groups and crowds arrive. The excavations of Herculaneum are usually less crowded than Pompeii but it is still sensible to arrive early in the morning, or late afternoon, when ticket queues are shorter and the site quieter. 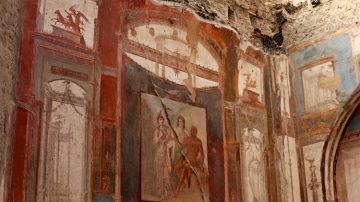 The cheapest tickets for the Herculaneum are sold onsite but the Campania Arte Card offer great savings too and allow for some skip-the-line benefits at busy times. 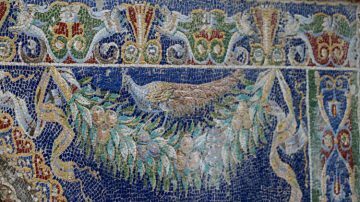 Guided tours and day trips are easy to book and often allow for seeing the excavations of Herculaneum and Pompeii on the same day. Admission is free for children under 18 and EU nationals over 65. The cheapest tickets for the excavations of Herculaneum (Scavi di Ercolano) are sold at the ticket windows directly at the archaeological site. All visitors to Herculaneum need to pick up a ticket at the ticket window, including online vouchers or mobile tickets and free tickets for children and pensioners. TIP: Pick up the map and information booklet at the information stand near the ticket window – the maps are not available once past the ticket check point and re-entries are not allowed. Herculaneum usually does not operate a fast-lane skip-the-queue ticket window but visitors with online tickets or the Campania Arte Card may go to the front of the queue – less embarrassing when enquiring at the information counter first on where to go. Priority entrance tickets to Herculaneum comes at a price premium and may be worth it at busy times but are usually not required when arriving early, or late, or outside the high season. The Excavations of Herculaneum (Scavi di Ercolano) are open daily from 8:30, closing at 17:00 from November to March and at 19:30 from April to October. Last admissions are 90 minutes before closing. The Excavations of Herculaneum are closed only on 1 January, 1 May and 25 December. The best times to visit the excavations of Herculaneum are early morning or late afternoon. At opening time – 8:30 – ticket queues are short and the site generally remains peaceful for at least the first hour. Similarly, arriving around two hours before closing time will see the ruins either quiet or getting progressively more peaceful. The excavations of Herculaneum are much smaller than Pompeii – visitors enjoy an overview of the complete site while walking from the main entrance gate to the ticket window. Around 40 houses are described – not all will be open. Guided tours to Herculaneum rarely exceed two hours and much less walking is required than at Pompeii. Also in contrast to Pompeii, many buildings at Herculaneum have roofs making afternoon shade more common. Food and drinking options at Herculaneum are truly dismal and once off the modern paved area, no water or toilets are available in the excavated ruins area. 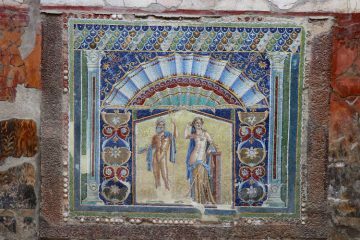 It is easy to reach and explore Herculaneum alone but guided tours are available and a good guide certainly could add value by pointing out elements otherwise easily missed. For families and small groups a private tour may be sensible as it may even work out cheaper and has the benefit of not having to wait for others to take selfies, etc. Pre-booked guides could sort out tickets in advance while available guides may advertise at the ticket windows for spontaneous bookings. As at other major Italian archaeological sites, all guides at Herculaneum are state certified and thus knowledgeable and not making up the story as they go along. Time and transportation wise it is easy to combine Pompeii and Herculaneum in a single day trip. However, given the ease of transportation, travelers staying in Naples may prefer to visit on separate days – Ercolano is only 20 minutes by train from Garibaldi station. Seeing both Pompeii and Herculaneum on the same day may be tough on feet and legs but this largely depends on condition and how extensively Pompeii is explored. It may be sensible to see Pompeii first – Herculaneum requires far less walking and distances are shorter once inside the archaeological site. Getting from Herculaneum to Pompeii is easiest on public transportation. The simplest way is the Circumvesuviana train that connects Pompei Scavi – Villa del Misteri station and Ercolano station in 20 minutes (15 minutes on the DD express trains) at least twice per hour. From Pompei Scavi take any train in the direction of Napoli, while from Ercolano take any train with Sorrento as final destination. Buy tickets from the ticket window at the station. 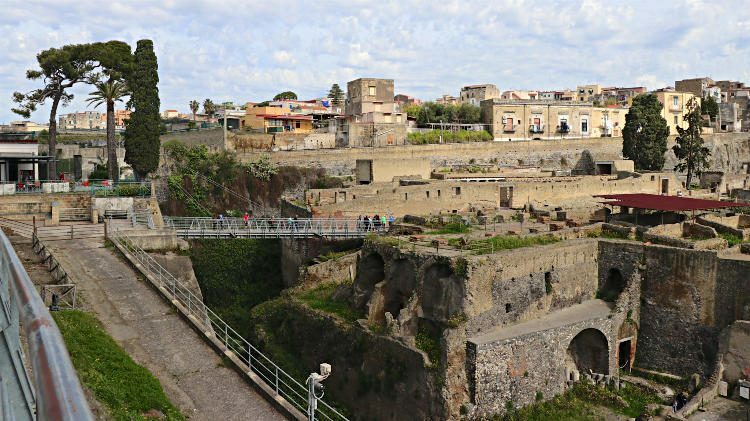 Many day-trips from Naples and Sorrento combine Pompeii and Herculaneum in a single day tour. For small groups and families it may be sensible – and often even cheaper – to book a private tour. Herculaneum is easily reached from the Ercolano station on the Circumvesuviana commuter train from Naples, Pompeii or Sorrento. Traveling time is only 20 minutes from Napoli Garibaldi or Pompei Scavi stations on at lest twice-hourly trains. See Transportation to Herculaneum for more details.